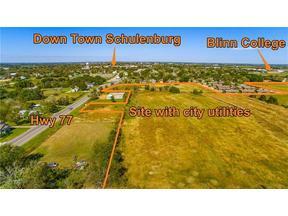 Great Buy & Hold property for future commercial dev w/frontage on Hwy 77 or residential subdivision. Zoned (R-1), located on south side @ HWY 77 & August St, location is prime as you enter city limits traveling north from Hallettsville. Ag exempt w/good portion of property in city limits. Surrounding site are single & multi-family homes. All new perimeter fencing & cross fencing along w/new water lines to troughs. Land once being developed as a residential subdivision-blueprints available. New survey.